The Murphy Windmill is a functioning windmill in San Francisco, California, United States. It was completed in 1908, and placed on the San Francisco Designated Landmark list in 2000. The windmill is south of Dutch Windmill on the western edge of Golden Gate Park in San Francisco, California. In the 1870s and 1880s, Golden Gate Park was planted on sand dunes and required substantial irrigation. In 1902, the Park Commission authorized the construction of two windmills to pump groundwater for park irrigation rather than purchasing water at exorbitant costs from the Spring Valley Water Company. The Murphy Mill was completed in 1908, and pumped 40,000 gallons per day to the park. Electric water pumps replaced the need for windmills in 1913, and the mill fell into disrepair. By the 1950s, the mill was in a state of ruin. It was placed on the San Francisco Designated Landmark list on July 2, 2000. In 1964, the San Francisco Citizens Commission for the Restoration of the Golden Gate Park Windmills was formed and led by Eleanor Rossi Crabtree, daughter of former San Francisco mayor Angelo Rossi. Plans for the Murphy Mill restoration began in 2002, with a reopening in 2012. Since 2012 the Dutch community in the Bay Area celebrates King's Day every year at the end of April near Murphy Mill. The event celebrates Dutch culture and traditions, including old Dutch kids games, flea market, Dutch food, beer, music, and dancing. ^ "Golden Gate Park Windmills & Tulips". Retrieved 19 April 2013. ^ ""Pacific Service" as an Aid to Nature in Golden Gate Park". Archived from the original on 4 March 2016. Retrieved 19 April 2013. ^ "Campaign to save the Golden Gate Park Windmills". Retrieved 19 April 2013. ^ "Windmills of California". Retrieved 19 April 2013. ^ "Murphy Windmill". Retrieved 19 April 2013. ^ "San Francisco Preservation Bulletin No. 9 San Francisco Landmarks". Retrieved 19 April 2013. ^ Colliver, Victoria (28 April 2012). "Golden Gate Park windmills both will turn". The San Francisco Chronicle. Retrieved 19 April 2013. ^ "Murphy Windmill reopens in Golden Gate Park". Retrieved 19 April 2013. ^ Administrator. "SFDutch.com | King's Day in San Francisco". www.sfdutch.com. Retrieved 2016-04-19. 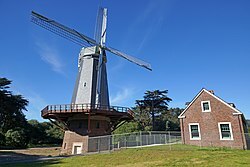 Wikimedia Commons has media related to Murphy Windmill, Golden Gate Park (San Francisco). This page was last edited on 29 January 2019, at 19:24 (UTC).